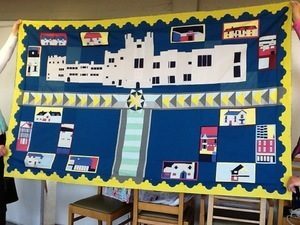 At Goosey Quilters, as you will read below we were involved in making a quilt for Castle Drogo. I heard during the middle of November 2014 the go ahead had been agreed, in the hope that the quilt would be completed by March 2015, and a meeting had been arranged for 30th November. I was led to believe the quilt was to be appliquéd and was designed reflecting the layout of the castle and grounds. I attended the meeting with one of Goosey Quilters best “appliqué-ers” only to meet the designer who in fact was an architect with no sewing experience! She explained that she had used foundation piecing as her preferred method of piecing and the top would be quilted by a professional quilter in London. The 3 volunteers from the castle who were hoping to be involved suddenly realised they were a bit out of their depth. I took a deep breath and volunteered that Goosey Quilters would help by making the blocks. The crunch came when we were given the deadline – February! Having enlisted 13 volunteers the blocks were finally pieced on 23rd February and suddenly all the grief and worry that we had, seemed to be dispelled – the top looked really good. The design shows the castle set in the grounds, the flying geese across the quilt represent the trees separating the castle gardens. The house blocks are positioned where the rose beds are in the garden and depict designs of either castle employees or volunteers. The outer border mimics the design of the path and flower beds in the garden, similar to the path in a castle in India that Lutyens also designed. By 24th March the quilt, backed and quilted in London was finally back at Castle Drogo in the bedroom which was to have been used by Julius Drew. Goosey Quilters hope to visit soon and be pleased with their efforts.